When L. Ron Hubbard founded the Church of Scientology in the mid-20th century, it's unclear whether he imbued his sacred texts with commandments regarding toilet bowl maintenance. While most religious books predate the regularity of porcelain thrones in homes across the world, Scientology's range of writings - from Dianetics to the most mysterious scriptures of the upper echelons - have the distinction of laying out the church's doctrines in the age of plumbing and Lysol with bleach. Which is probably why actress Nazanin Boniadi was supposedly forced to scrub a toilet bowl with a toothbrush as punishment for upsetting Tom Cruise. On the heels of his split with Katie Holmes, Cruise is garnering even more criticism (and twice as many uneasy glances) as news of his Church of Scientology-hosted girlfriend auditions makes the rounds. According to Slate, an upcoming Vanity Fair Magazine exclusive will cover the trials and tribulations of Nazanin Boniadi, who won the role of Cruise's girlfriend in 2004 after the star split with longtime wife Nicole Kidman. Who is Nazanin Boniadi? An actress with a pedigree above toilet scrubbing, that's for sure. The source reports that Boniadi is best known for a recurring role on the sitcom How I Met Your Mother, and was already a Scientologist at the time of her matchmaking with Cruise. The Vanity Fair correspondent, Maureen Orth, reports that between November of 2004 and January 2005, the Iranian-born, London-raised Boniadi rode the rollercoaster of manic states and severe scrutiny the public has come to associate with Cruise. Toilet bowl scrubbing was only one of many punishments handed down by both him and Scientology officials. 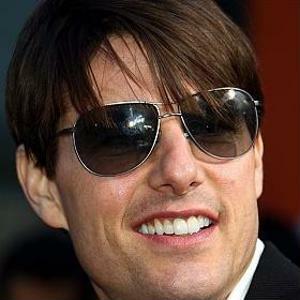 When Cruise eventually broke up with Boniadi, it was through the church, reports Orth. Not a word from the man himself - a move most folks abandon sometime after high school. Vanity Fair and Slate both assure us that Boniadi is no longer involved with Scientology, unsurprisingly. This isn't the first time that former members have gone to press in an attempt to out the church for its practices, most of which have ranged between harmless and odd to illegal and frightening. Toilet bowl scrubbing lands somewhere between the two extremes. Hopefully Boniadi will find some peace, and the next time she has to take care of her own bathroom clean up, there will be a full-sized toilet brush on hand.